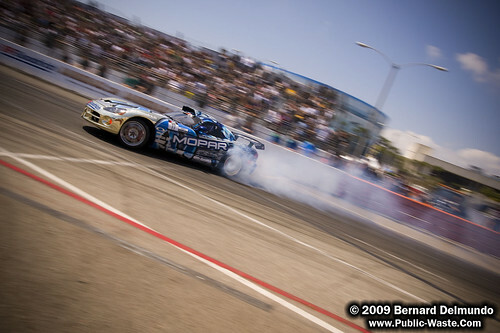 A new year, new season, new competition format, new cars… Yet I still found myself wide-eyed with the unpredictable nature of drifting that sticks to the sport no matter what other changes occur. 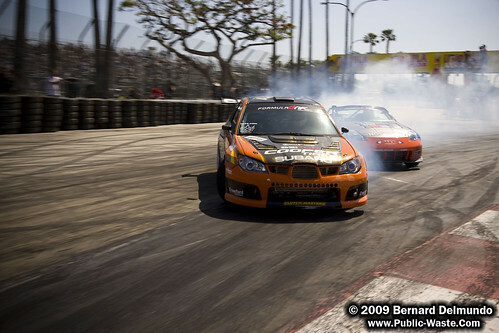 One thing is for sure: if the Formula D drivers continue to drive like they did at Long Beach, it’s going to be one hell of a season. Not too long ago, the Formula D website announced that the competition format would change from a top 16 field to a top 32 field. This allows more drivers the chance to qualify for the big show and promises more action for the crowd in attendance. The format change came through on both projections, but it also introduced a larger chance for upset. 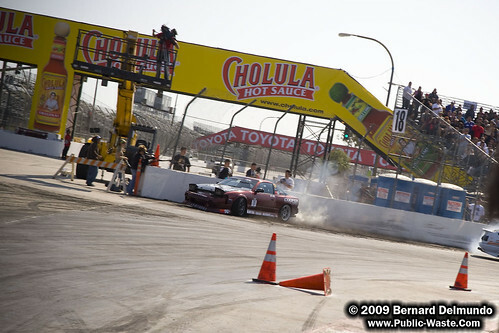 This was evident when fan favorite and high-profile drifter Rhys Millen was knocked out of competition in the first round. Millen was one of a few drivers behind the wheel of a new car for 2009. 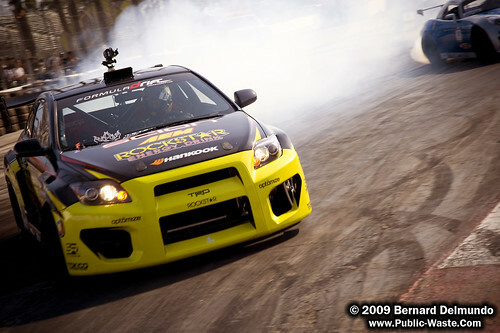 Calvin Wan and Tanner Foust are two more sporting new vehicles. 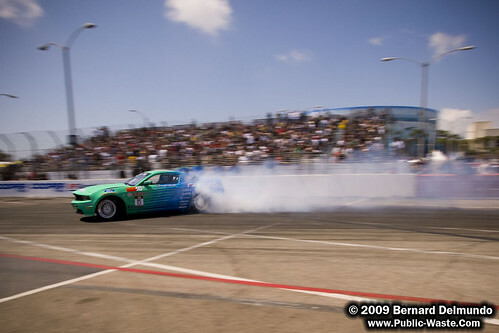 Vaughn Gittin Jr showed off his 2010 Ford Mustang GT. Sam Hubinette continued to pilot his championship Viper, but has announced and displayed a brand new Dodge Challenger to be used later in the competition season. I have to make note of a SoCal local, Matt Powers. 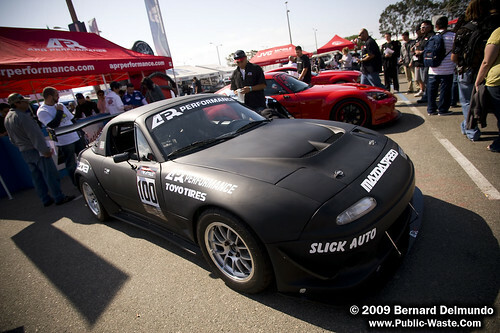 He’s a college student from San Diego who brought his car up through local competitions and events until finally entering the Formula D arena. 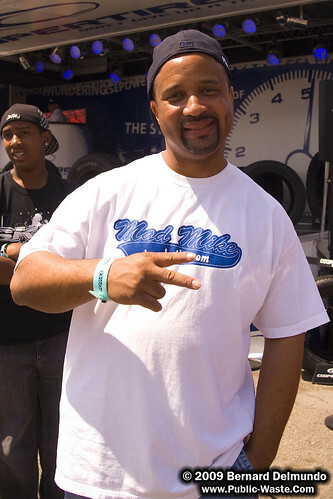 Although unsponsored, he made it into the Top 32 and showed the fans in attendance that anyone can compete. The big vehicle transports and big name sponsors don’t have to be your foot in the door. The Top 32 round ended with a short “half-time” break. 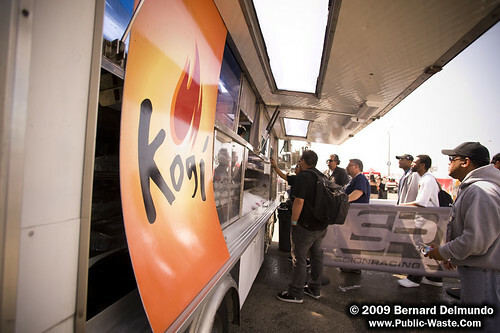 Cars, drivers, fans, and even some celebrities crowded the pit and merchant area. 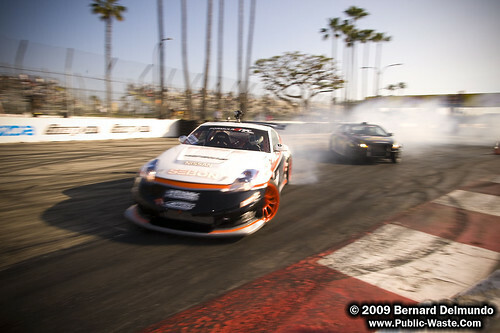 The beautiful thing about Formula D is the grassroots feel you get when walking around. 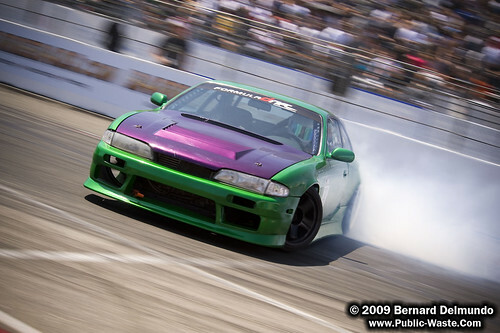 It’s not uncommon for you to pass by your favorite drifter while walking to buy a hot dog. Or if checking out the heart of each car is your thing, there’s no velvet rope or armed guards to stop you (be sure to check out Tanner Foust’s new ride if you get a chance. It’s a BEAST!). And of course, it wouldn’t be a car event if it didn’t have models floating around. The Top 16 into the finals were definitely crowd pleasing. 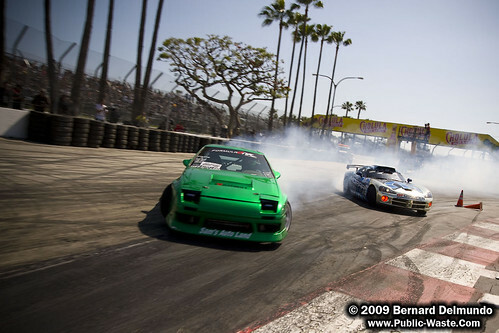 Cheers and jeers along with Jarrod’s drift-by-drift commentary filled the sunny California atmosphere. Everyone was driving hard… Sometimes a little too hard. Walls were kissed, bumpers were lost, and some cars just spun to a halt. One stand-out round was the muscle battle for a Top 4 spot between Samuel Hubinette’s Viper and Vaughn Gittin Jr.’s brand new Mustang. 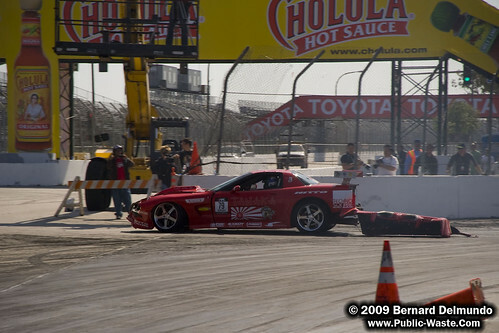 These two went at it like it was already Round 7 at Irwindale. 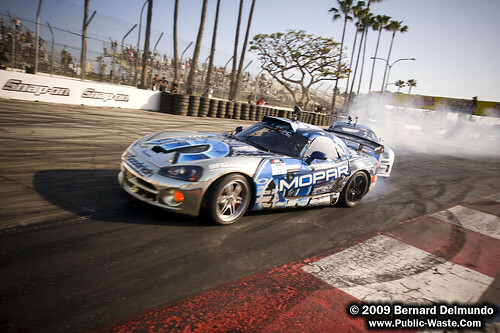 Arguably the two loudest cars of the field going head-to-head and the crowd was loving every second! A collision during one run blew out one of Hubinette’s tires and left Gittin’s front side looking far less than new. They continued with Hubinette pulling out the win for the Top 4 spot. 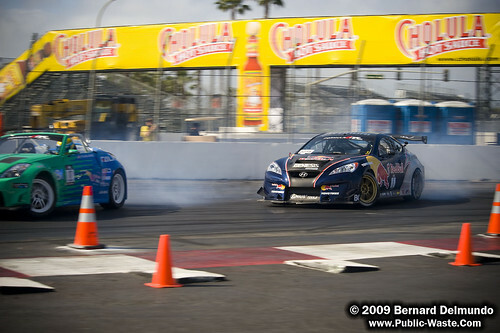 Even more memorable than that battle was the one put on by Ryan Tuerck and Tanner Foust. These two were so consistent and, above all else, so close together through the entire course! It didn’t matter who was leading or following, these two made it really hard on the judges. In fact, it was so difficult for the judges to determine who advanced to the finals that Tuerck and Foust had to run a second time. When that set of runs was too close to call, the judges had the pair run a third time! 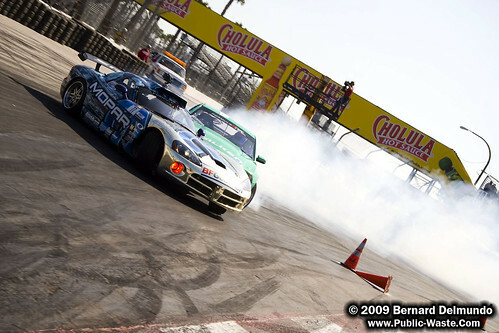 In the end, it was Tuerck who went on to the finals against Hubinette. 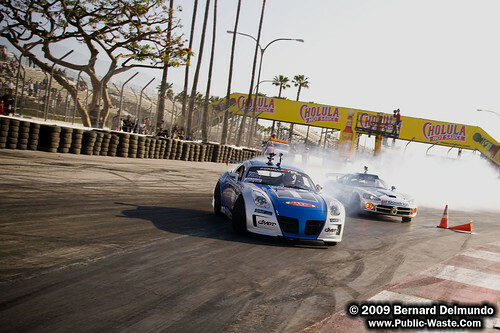 After Foust took out Robbie Nishida’s 350Z for third place, it was time for the last round of the day. Ryan Tuerck did battle with Sam Hubinette for the first win of the season. The winner would go into the next event with a head start in overall points for the series. 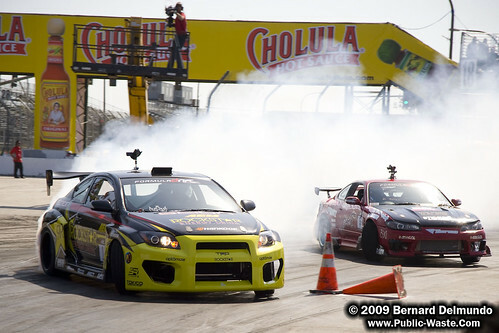 The final round was very close, but Tuerck was able to continue his rise to the top with consistently spot-on driving. 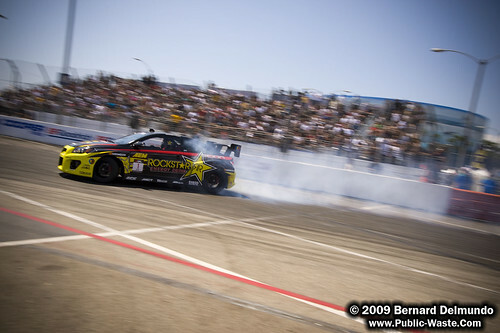 Ryan Tuerck took top honors putting Hubinette in the second place position. Overall it was a great event. 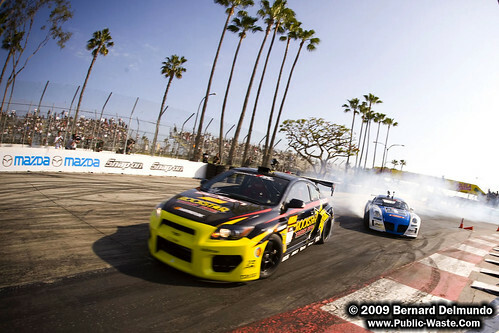 Formula D promised excitement and action, both of which were delivered on a grand scale. Great job to all the drivers! It was an impressive start to the season and we’re looking forward to how things turn out by the end of the year in Irwindale. 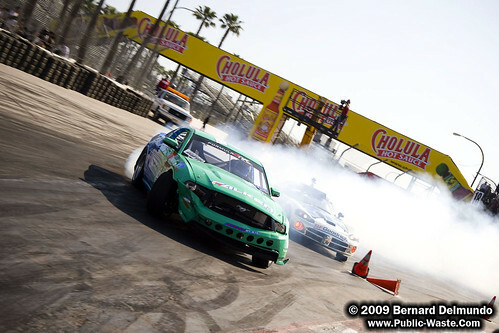 Many many thanks to John at the ID Agency and the Formula DRIFT staff for putting on another successful event. I met a lot of cool people while walking around and hanging out in the media area, and it was most definitely a pleasure to do so.